Had enough of the heat and dust of the city? Head to the Mayfair Himalayan Spa Resort in Kalimpong to relax and recharge. This Himalayan hotel was started by the Scottish David MacDonald in 1905 and managed by his family for 117 years. It has now been taken over by Mayfair Hotels and Resorts and converted into a super-luxurious 4-star spa resort. History lurks in every corner of this heritage hotel, which has played host to Prime Minister Jawaharlal Nehru, the 13th Dalai Lama, Bollywood stars such as Sunil Dutt, Nargis and a very young Sanjay Dutt, Dev Anand and Zeenat Aman. It was the place where novels like City of Joy were written by author Dominique Lapierre. The Himalayan hotel has also hosted Sherpa Tenzing Norgay and Edmund Hillary, the first people to conquer Mt Everest. 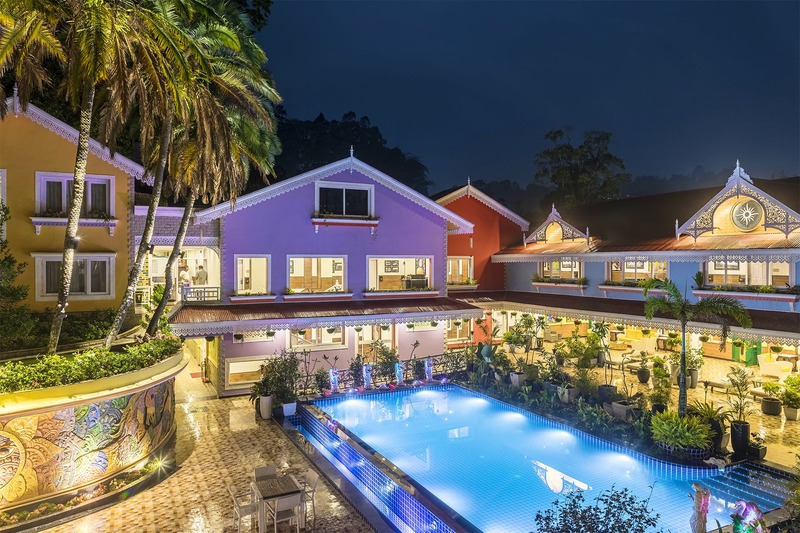 Mayfair Himalayan Spa Resort is located on Upper Cart Road in Kalimpong, approximately three hours away from Bagdogra Airport and 2½ hours from New Jalpaiguri railway station. You can take in a magnificent view of the Himalayas (even Kangchenjunga on a clear day), while you get yourself a massage, get a drink at John’s Tavern or simply lounge around on the open air terrace. The two restaurants in the property, Tiffany’s and Mamma Mia offer a choice of Indian, Continental or Chinese food. We especially recommend the local dishes available. While momos are available everywhere, nothing can beat the taste of momos and in the Himalayas. But the show-stealers are the thukpa and the thenthuk, which are made home-style, and have a unique rich taste. The fact that mobile connectivity is bad in this part of the country is actually a boon, because you can put away your phone and bury yourself in a book in the library or even get some DVDs and catch up on some classic Hollywood and Bollywood films. The hotel does offer WiFi, but you don’t travel all the way to Kalimpong to surf the net, do you? Want to live like a king? Get yourself a suite in the heritage wing. These are tastefully restored rooms where stalwarts like Nehru, Dominique Lapierre and Russian painter Nicholas Roerich once stayed. The massive four poster beds, fireplace and antique furniture and fittings will take you back in time. For families with young children, there is even an open air play centre and a children’s room for kids below 6. There's lots to do. Hire a car and head out to Deolo for some fabulous views of Kalimpong from above. Check out Dr Graham’s Homes and the Katherine Graham Memorial Chapel. In town there is also the beautiful McFarlane Memorial Church and the ruins of Gouripur House, where Rabindranath Tagore once stayed. Want to head further out? Mongpu and Silerygaon are breathtakingly beautiful and just a couple of hours drive away. Want to experiment with some local eateries? Walk out of the hotel’s rear exit and walk into Za Khang for some authentic Bhutanese delicacies, or take a taxi ride to the local market and chill out with some beer and fabulous crispy chilli pork at Gompu’s Bar and Restaurant.